Looking for quick and easy recipes? This has to be the simplest and quickest of my wonderful snacks. 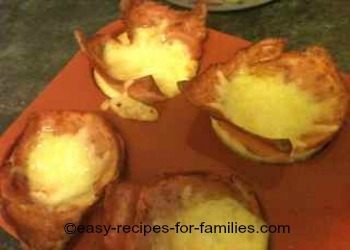 All it takes is to pop a slice of ham in a muffin tray, fill it with beaten egg and bake till it sets. It takes just 15 minutes and you have a hot, tasty meal which is yummy on hot buttered toast. This recipe makes 6 Ham and Egg "Pies"/Quick Bakes. •	Pour egg mixture evenly into the 6 ham lined muffin "holes"
Let them stand for a few minutes to cool and enjoy the quick bake on hot buttered toast. How was that for quick and easy? Use silicone muffin trays so as to eliminate the greasing and lining procedure. This recipe is ideal to making several to freeze to be defrosted later for school lunches, pot luck lunches, an attractive snack for unexpected visitors, as a quick and simple appetizer for dinner parties and perfect for picnics and camping trips. For those on a protein diet, this quick snack fits the bill as it is protein rich. However you serve this simple recipe, it is certain to be a winner! © Copyright EasyRecipesForFamilies 2012 - 2013 Caution: EasyRecipesForFamilies will report copyright violators to Google. Websites that take images or imitate content can lose their Google Adsense and/or publishing privileges.